Skip-tooth design glides through thickest hair to fluff and pop for a quality professional look. 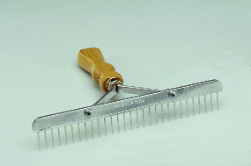 Minimizes matting when combing in hairdressings. Saves hair. Reduces hair loss from grooming and working. Adds fluff and pop. Minimizes matting with oils, dressings.